Isolating a laboratory's sensitive microscopy equipment against low-frequency vibration has become increasingly more vital to maintaining imaging quality and data integrity for neurobiology researches. Ever more frequently, laboratory researchers are discovering that conventional air tables and the more recent active (electronic) vibration isolation systems are not able to adequately cancel out the lower frequency perturbations derived from air conditioning systems, outside vehicular movements and ambulatory personnel. Such was the case with the department of physiology and biophysics at Georgetown Univ. Medical Center, where Jian-Young Wu has been conducting research on waves of neuronal activity in the neocortex of the brain. The neurons of the neocortex are arranged in vertical structures called neocortical columns. These are patches of the neocortex with a diameter of about 0.5 mm and a depth of 2 mm. Each column typically responds to a sensory stimulus representing a certain body part, or region of sound or vision. Researchers postulate that the human neocortex contains about a half-million of these columns, each of which contains -60,000 neurons. "It is like viewing a few pixels on a television screen and trying to figure out the story," explains Wu. "Now, with optical methods and voltage-sensitive dyes, we can visualize the activation in a large area of the neocortex when the brain is processing sensory information, similar to watching the whole television screen." "Voltage-sensitive dye is a compound that stains neuronal membrane and changes its color when the neuron is excited," continues Wu. "This allows us to visualize population neuronal activity dynamically in the cortex. We study how individual neurons in the neocortex interact to generate population neuronal activities that underlie sensory and motor processing functions. Population activities are composed of the coordinated activity of up to billions of neurons. Currently, we study how oscillations and propagating waves can be generated by small ensembles of neocortical neurons." Since voltage-sensitive dye signals are small, usually a change of 0.1 to 1 % of the illumination intensity, Wu's team has used a high-dynamic-range camera, photodiode array to detect the voltage-sensitive dye signals of the cortical activity. The photodiode array can resolve extremely small changes in light, usually one part of ten thousands. (Human eyes and ordinary digital cameras register light changes of one part to a hundred). Detecting such small signals requires an extreme isolation of vibration. The lab had to contend with low-frequency vibrations from air conditioning equipment, people walking and wind blowing against the building. Vibrations as low as 1 Hz were inhibiting the integrity of the images and data. "At first, we used high-quality air tables, but they were not adequate for isolating low-frequency vibrations," Wu says. "We tried putting a second air table on top of the first one, but that still did not give us the isolation we needed. Then we tried an active, electronic system, but we were still spending much time fighting with floor vibrations. We were dealing with an unresolved vibration problem for many years." The Georgetown lab eventually tested and settled upon negative-stiffness mechanism vibration isolation systems from Minus K Technology, which enabled the lab to get vibration isolation down to a level of 1 Hz. This effectively cancelled out any vibration noise difficulties that were inhibiting image and data readings. Negative-stiffness mechanism (NSM) isolators have the flexibility of custom-tailoring resonant frequencies vertically and horizontally. They employ a completely mechanical concept in low-frequency vibration isolation. 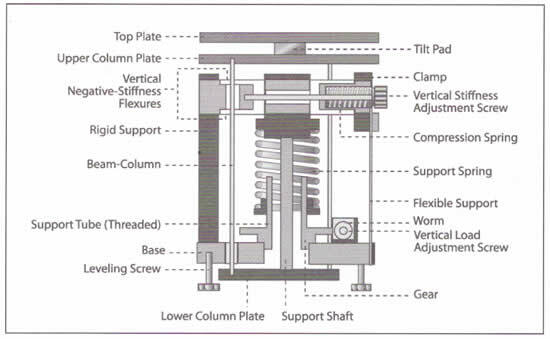 Vertical-motion isolation is provided by a stiff spring that supports a weight load, combined with a NSM. The net vertical stiffness is made very low without affecting the static load-supporting capability of the spring. Transmissibility with negative-stiffness is substantially improved over air systems, which can make vibration isolation problems worse since they have a resonant frequency that can match that of floor vibrations. Transmissibility is a measure of the vibrations that transmit through the isolator relative to the input vibrations. The NSM isolators, when adjusted to 0.5 Hz, achieve 93% isolation efficiency at 2 Hz; 99% at 5 Hz; and 99.7% at 10 Hz. NSM transmissibility is also an improvement over active systems. Because they run on electricity, active systems can be negatively influenced by problems of electronic dysfunction and power modulations, which can interrupt scanning. They also have a limited dynamic range-which is easy to exceed-causing the isolator to go into positive feedback and generate noise underneath the equipment. Although active isolation systems have fundamentally no resonance, their transmissibility does not roll off as fast as with negative-stiffness isolators. Within the past 10 years, Wu's team has documented a variety of waveforms (e.g., plane wave and spirals) in brain slices during artificially induced oscillations. Using neocortical slices and mathematical models, they are studying the initiation of the waves and the factors that control their propagating direction and velocity. The lab is also involved in the development of new optical imaging techniques-relying on the negative-stiffness vibration isolation systems-such as imaging propagating waves in vivo, in intact brains. "This is technically difficult," says Wu. "Other imaging methods (MRI, PET or MEG) provide inadequate spatiotemporal resolution. Large-scale neuronal activity is a hallmark of a living brain. We are improving the optical imaging techniques with a hope to visualize the waves in the cortex in vivo during sensory processes and in awake animals while behavioral and cognitive tasks are performed." Source: Minus K Technology Inc. (www.minusk.com). The company develops, manufactures and markets state-of-the-art vibration isolation products based on patented negative stiffness-mechanism technology.